Before we begin, do you know that understanding our current health conditions are important. Early detection and prevention can saves life and money too. I am glad that I did a quick check of my blood pressure, blood glucose, cholesterol, bone mass and also Body Mass Index at the Heart Smart Workshop. The workshop took place at Pantai Hospital Kuala Lumpur on the 22nd of September. During the workshop, I learnt about the 3 effective, and seemingly simple steps on how to Eat Smart, Move Smart and Sleep Smart to best care for our heart, as well as the benefits of nutritious products such as Anlene Heart Plus. It’s never too early to start caring for your heart and mobility so that you can continue to live your best life to its fullest Anlene champions healthy living by highlighting mobility, bone joint and muscle functionality, and the importance of leading an active lifestyle to support a healthy body including good heart health. The 5 speakers at Heart Smart Workshop ~ Pn. Megawati Suzari, New Product Development, Scientific & Regulatory Affairs Director at Fonterra Brands Malaysia; Datuk Dr. Sanjiv Joshi, Consultant Cardiologist at Pantai Hospital Kuala Lumpur; En. Muhammad Izzat Sallehan, Senior Physiotherapist at Pantai Integrated Rehab Services Sdn. 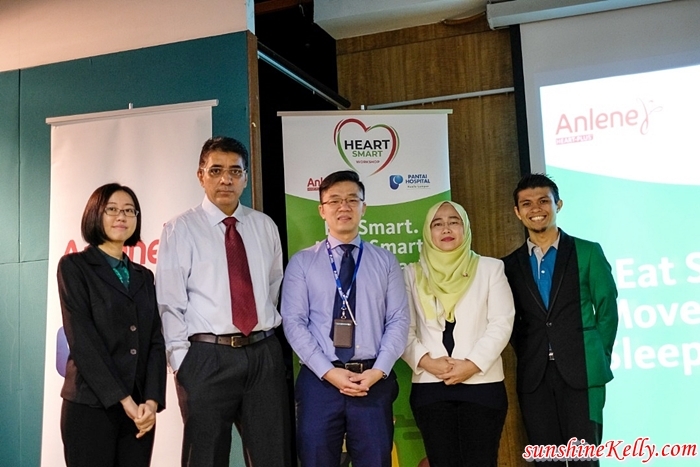 Bhd; Ms. Liew Yen Lee, Senior Nutritionist at Fonterra Brands Malaysia; and Dr Kong Min Han, Consultant Ear, Nose and Throat Surgeon at Pantai Hospital Kuala Lumpur shared and discussed some of the ways in which heart health can be achieved by ensuring that we Eat Smart, Move Smart, Sleep Smart. Usually I will go for a healthier choices of food, more greens, fruits and unprocessed food. Plus I try not to skip breakfast, have at least a glass of milk or with cereals or oats. Anlene Heart Plus can be incorporated easily into my daily diet. It’s specially formulated with beneficial ingredients such as plant sterols, to help reduce cholesterol, as well as other ingredients such as omega-3, collagen, calcium and protein. Part of healthy lifestyle is to keep our body moving and exercise makes us feel great. Although my schedule is hectic I will squeeze at least 30 minutes 3 times a week. Leading an active lifestyle, coupled with a healthy diet, will promote better blood pressure, lower cholesterol & triglyceride levels, less fat around the heart, reduced inflammation and reduced stress hormones. We should aim to get a minimum of 10,000 steps a day and look at incorporating moderate and intensive workouts 2-3 times a week to get our heart health going. This is one of the concerns that I should rectify. Living in the city with so much to do and so little time, 24 hours is not enough for me. Do you know that 90% of Malaysians suffer from sleep problems and Malaysians tend to sleep an average of 6.4 hours a day. Studies show that people who experience poor sleep have a 71% risk of suffering from heart disease. Many Malaysians suffer from sleep apnea, and do not realize it; Dr. Kong Min Han says it is “When you have slept for 7-8 hours, and you wake up feeling like you haven’t slept at all.” Sleep apnea is a high risk factor for heart disease because of its effect on your blood pressure and nervous system. Your sympathetic nervous system controls your heart rate and blood vessel constriction. Healthy diet and exercise both play immense roles in fitness improvement, as well as heart health. Studies have shown that specific types of exercise are most effective at improving heart health and stabilizing your blood pressure. These exercises can also cut down your cholesterol level and contribute to overall improvements in cardiovascular health. Besides, to have a healthy heart we must learn to be happy. It is important to learn how to sleep smart in order to feel less tired and stressed during the day, as well as eat smart and move smart. The ultimate goal is to be Heart Smart – and to understand that heart health is more of a journey than a destination, with many benefits along the way. Alright, here is a bit of my sharing about how we can incorporate Eat, Move, Sleep Smart into our daily life for a healthy heart. All these are all about consistency and cultivate them as part of our lifestyle. With a healthier body and heart we can live happier and also saves a lot of medical bills.